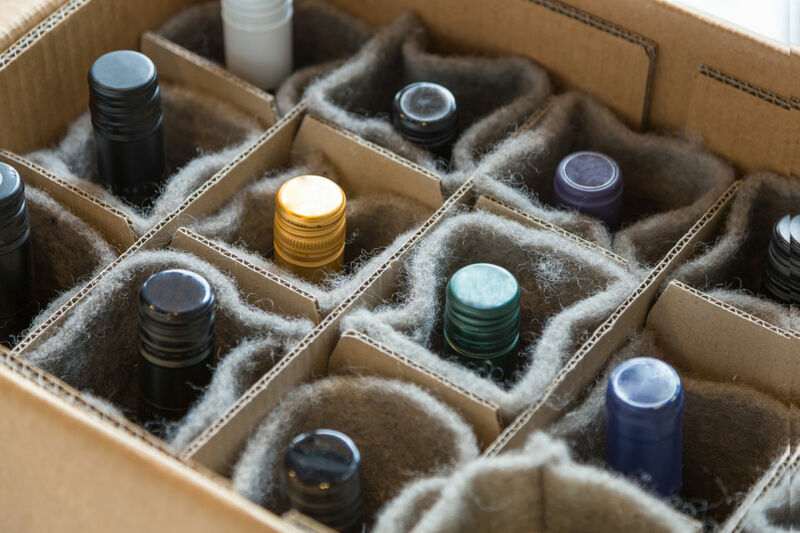 "We were astonished to open the wine box and discover the packaging. Absolutely amazing! We were SO imporessed by the eco-friendly products that had been used to protect the wine during the shipment. The thick cardboard box to start with and then the individual woolen socks guaranteed that there was no damage to the wines at all. You can't go wrong! Great product! "We used the packaging already in several ways. I cut the top layer into circles to put under our couch so that i would be easier to slide on the hardwood floors. One of the bottle sleeves, I wet then froze with an empty bottle inside of it, so that it acts as a temporary cooler instead of ice when we bring wine to friends' houses. The rest of the koozies we kept on the bottles so they don't jostle in their box as we prepare to move to a new house. I was thinking of taking one of the sleeves and shoving it in the crack between my driver's seat and the center console because I always seem to drop my phone/chapstick/work ID down there. Thanks so much - we are big fans of the greener shipping products!" Delivering over 100,000 cases to the doors of NZ wine lovers across the globe for the past 12 years, we began to consider the potential impact our polystyrene packaging was making on the environment. Our social conscience and genuine desire to reduce our carbon footprint drove us to make a change and seek a sustainable solution. We tested and trialed a number of concepts already on the market, but found nothing that offered adequate temperature stability or protection from handling and impact damage. Winter 2018 and a couple of well timed 'light bulb moments' led us to what you see in front of you today. As an additional personal touch, every single bottle is fitted into it's very own woolen sleeve, these sleeves are specially crafted and hand sewn by a small family owned New Zealand company . So there you have it. Our Thermo-Eco Wine Packaging, and the first step on our journey towards sustainability. We are fully committed and proud to support the New Zealand Wine industry in our common quest towards sustainability.